On Tuesday afternoons, I get the opportunity to sit and read for about 40 minutes as I wait for my daughter’s Speech Therapy class to get done. My 8yo son and I will usually sit in the upper part of the High School gymnasium where, on some days, I will read him a book or two, giving him a little extra one-on-one time with mom. Other days, when he is more intrigued with watching the High School boys during gym class, or would rather just play with his toys, I will read something just for me... something that is usually encouraging, inspiring, or informational... and will conveniently fit into the front pocket of my purse. To name a few titles that have automatically found a home tucked between my checkbook and my wallet, I remember having a Guideposts magazine to read, as well as one from Remedy. Both of these magazines are just the right size for a carry-along bag or purse. More recently, I have been reading Eternal Encouragement. It is also a small, take-along size, and it just so happens to be this month’s Gabby Mom’s review. Let me tell you, if any of you moms out there are looking for an inspiring magazine to subscribe to, this would be the one! I don’t say that lightly. I’ve read my share of some great magazines in the past - some for parenting, cooking, homemaking, homeschooling, Christian living, health, etc. ; and, to be quite honest, I really didn’t think Eternal Encouragement would be overwhelmingly impressive to me at first. However, as I began to read the articles (this issue’s theme was “Time Flies”), I didn’t read just one or two encouraging... or helpful... or convicting articles. I’d say at least 3/4 of the magazine really spoke to me in a way that no other magazine ever has. To be fair, there’s a chance that this issue’s theme just really hit home to me, as I’ve certainly been struggling with how I spend my time and how some of it could be spent in better ways. I can see how the Lord has so lovingly and patiently been speaking to me in numerous ways over the past few months about how my days are numbered... about how my children are growing up so quickly... about how much time is wasted in a day doing things that should be at the bottom of my list rather than the top. I know it wasn’t a coincidence that all of these things, and more, were discussed in various articles in this issue of the magazine, solidifying that I need to be faithful in prioritizing every activity of every day. So, granted, I only have this one issue to go off of. But, after reading this one issue, I am totally curious to know what the next issue will entail.
. 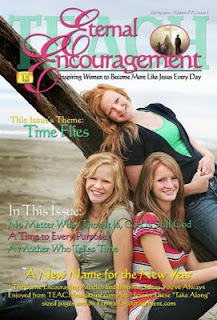 I reviewed Eternal Encouragement Magazine as an official member of The Gabby Moms blogging program. I did not receive compensation for this post and all opinions are solely my own. I love the of the magazine in your purse! Nice touch. I was going to comment about the picture of the magazine in your purse too! That was a clever idea! Thanks for stopping by my blog. I'm following your blog now. Here, here! Good review. Thanks! I like how you broke down what the magazine is all about! I saw Lorrie speak at a homeschool convention a couple years ago and subscribed to TEACH for a year then... it really is great.... and it really does speak to you in each issue :-) I don't have any magazine subscriptions right now but if I had one... it would be this one! Hello! I'm a fellow Gabby mom stopping by to read your great review. The picture with the magazine in your bag is a nice touch. I am following you now and hope you can visit my blog, too, and follow back. Great review! It's always a plus when what you want to read fits in your purse!